Maybe this post should be as much about the man as it is about the car. How many of us have dreamed about designing and selling our own line of cars? Stanley H. "Wacky" Arnolt not only dreamed it, he did it. No, technically, he didn't design or build these cars, but Mr. Arnolt conceived these cars (and other Arnolt cars, notably the Arnolt-MG) and sold a fair amount of them. Even in the simpler times of the 1950s, that was a quite an accomplishment. The running gear is pure Bristol and the body was designed and built by Bertone (It has been said that Arnolt saved Bertone when he commissioned the company to design his original car, the Arnolt MG - Think about the beautiful cars that have come from the Bertone studios since then. If that story is true, Arnolt should be given some sort of automotive sainthood). 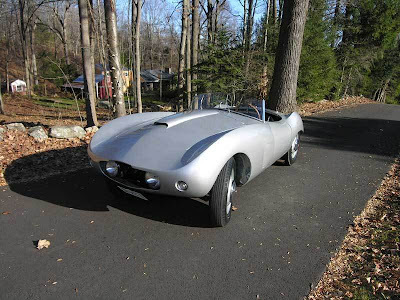 The car being offered on eBay is a 1954 (the Arnolt Bristol having been built from 1954 through 1959) Bolide model. This car has the optional side curtains and convertible top. The car is not being represented as perfect, but as a very good example. The (non-matching number) engine has been rebuilt, but the paint job is older and has a few chips and blemishes. The side curtains and top appear to need attention. It may not be a concours winner, but it's certainly a car you could get into and drive today and one that would get plenty of attention at any car show. There are around 80 of these cars left in the world (out of roughly 140 built) and I'm sure this car won't sell cheap. But, if you have the money and want a piece of American / British / Italian automotive history all rolled into one car, you can't do much better than an Arnolt Bristol. Life, business, and times have changed a lot in the 55 years since this car was built, but maybe what the automotive industry needs right now is another couple of guys like "Wacky" Arnolt to bring some excitement back to it. Located in Bethel, CT, click here to see the eBay listing for this car. Click here for the Arnolt.com site. While not sold in the US, Bristol is still in business in the UK - Click here to see their website. Click here for the Bristol Owners Club site - a wealth of Bristol information.